Background: Bacterial leaf blight (BLB) of rice occupies the most significant position among various potentially important bacterial diseases all over Pakistan. The first important step towards the management of this disease is the characterization of the pathogen. Methods: Survey was conducted and disease samples were collected from 9 different locations of Punjab. Isolation and characterization by biochemical tests was done from the diseased samples under standard conditions in the laboratory. For pathogenicity and virulence characterization, all isolates were inoculated on IR-24, Basmati super and Basmati-2000 varieties. Data was recorded after three weeks of inoculation. Results: 30 isolates of Xanthomonas oryzae pv. oryzae (Xoo) were purified from the diseased plants of different geographical origin which had very similar morphological and biochemical characteristics. PXo-20 (causing 51.35% leaf damage) and PXo-16 (causing 50.05% leaf damage) were found most virulent for Basmati Super and Basmati-2000. Conclusion: The presence of highly virulent isolates in Sheikhupura is alarming and there is dire need to incorporate new resistance genes in commercial rice cultivars to cope with BLB. Rice (Oryzae sativa L.) is a major food crop of the world particularly in Asian countries like Bangladesh, Vietnam, Korea, China, India and Pakistan. Rice is ranked second in cereal cultivation and feed for 2.7 billion people around the world [1,2]. About 90% rice of the world is grown in Asian countries and among them, Pakistan is the third largest basmati exporter . Rice varieties which are cultivated in Pakistan are; ‘Super basmati, Super Shaheen, KSK-282, Super fine rice, Super kainat, Super kernel, PK-196 and PK-386. Pakistan’s ‘Basmati-Super’ and ‘Kernal’ rice varieties are popular in world for their fragrance and taste. It is however, unlucky that such a major crop is under attack by diseases of viral, fungal and bacterial origin. Bacterial leaf blight (BLB) of rice  incited by Xanthomonas oryzae pv. Oryzae (Xoo) was noticed first time in Japan . In Pakistan first evidence of BLB was recorded in 1977  and afterwards in 1987, its occurrence was confirmed from all the provinces of Pakistan . The major bacterial blight outbreaks occurred in the 1960s. It is the most destructive disease, which is common in the major rice growing countries of Asia . BLB is found in deep water, rainfed, irrigated, temperate and rice cultivating tropical areas of the world. The disease occurs in both dry and wet seasons and affects rice plants at any growth stage under tropical conditions . Its complete infection which is called as kresek phase results in desiccation and death of the leaves, mainly of young seedlings when transplanted in the field. Blight of rice severely affects filling of the grains and emergence of panicles thus reducing yield considerably in susceptible cultivars of rice . The overall losses in rice crop due to blight are up to millions of tones . Therefore, improvement in breeding practices has become an important objective for the development of resistant rice varieties against BLB in many rice cultivating areas . The disease reduces cereal production to varying levels which depend upon the age of the crop, susceptibility and environmental factors . Recently, an increase in BLB disease incidence is reported in the most important rice sowing areas including Kaller belt that is well-known for cultivation of high quality rice [13, 14]. Survey is conducted each year during August to October to determine the disease momentum in fields all over the Punjab. In the current perusal, isolation, purification, morphological and biochemical characterization was carried out for isolates of BLB pathogen collected during 2013. Rice fields near to roadside, research stations and adjoining farmer fields were preferred for the survey because disease appeared in epidemic form on roadside due to intensive cultivation. For each field, samples were taken at 5 points/hill along the diagonal transect. 4 plants at each point/hill were observed for diseases symptoms . Disease samples at 5 hills with five symptomatic leaves from each 1 m2 sampling area were collected for isolation purification, confirmation and biochemical characterization of the bacterium. The recovered isolates were selected for preservation and labeled with working codes. The blighted samples were cut into small pieces and surface sterilized with 70% ethanol for 1 minute. Then samples were washed twice by sterile distilled water for 2 minutes and left there for 20 minutes in eppendorf tubes for the release of bacteria in water. That bacterial suspension was streaked while leaf sample were placed on fresh nutrient agar (NA) plates and both were incubated at 30˚C for single colony formation. The single purified colonies of bacteria were streaked on NA slants for further confirmation and preservation. Gram’s staining was performed as first discriminatory test for the subject bacterial pathogen. Indole production of Xoo isolates was tested with bacto-tryptone medium composed of tryptone, 10 g and NaCl, 5 g in 1000 ml of distilled water. Medium was inoculated and incubated at 30˚C. After 2 and 5 days of incubation, 0.3 ml indole reagent was added into each tube followed by gentle shaking. Results were observed after 10 minutes for indole production. Tubes containing MR medium were inoculated with pure culture. Tubes were incubated at 37˚C for 5 days and results were recorded after the addition of methyl red reagent. Tubes containing methyl red medium were inoculated with Xoo culture and incubated at 37˚C for 48 hours. After incubation VP reagent was added and results were recorded after 2 hours of incubation at room temperature. For citrate utilization test, bacteria was inoculated on Simon's citrate agar slants. Presence or absence of growth was recorded after incubation of 4 days at 37˚C. The medium composed of NaCl 5 g; CaCl2.2H2O 0.1 g; peptone 10 g and agar 15 g in 1000 ml distilled water was prepared and pH was adjusted to 7.4. Media was autoclaved and 1% of Tween 80 was added to the molten media. The media was poured into the sterilized petridishes. Each isolate of Xoo was streaked and incubated at 30°C for seven days. After 7 days, growth was recorded . Thornley’s medium was prepared by adding all the ingredients into DAW and boiled to dissolve the agar. pH was adjusted at 7.2, then medium was poured into the screw-cap tubes and autoclaved at 121°C and 15psi for 10 minutes. Tubes were stab inoculated from the 24 hours old colonies, covered with 1 cm paraffin oil (sterilized) and incubated at 27°C for three days. Thirty (30) purified Xoo isolates were tested on a susceptible rice line IR 24, Basmati super and Basmati-515. Seeds were sown in potting mixture and kept under high moisture conditions at optimum temperature of 28–32°C. Inoculation was done by leaf clipping method. The plants kept in negative control group were inoculated with sterile saline solution. Appearance of lesion was observed and isolates were characterized avirulent/virulent depending upon the % area covered by the lesion . The leaves samples placed on NA plates showed the bacterial colonies after 24 hours of incubation at 30oC temperature (Fig. 1). The visual observation was done to identify the colony morphology. The colony color of all the nine isolates was observed yellow. The colonies were medium to small and circular in shape with even margins (Table 1 in supplementary data). Seven biochemical tests were conducted to characterize 30 isolates of pathogen. All isolates consistently gave similar results (Fig. 2, Table 2 in supplementary data). The pathogen was a Gram negative rod with scattered arrangement. VP test indicates whether or not an organism produces certain specific compounds (acetylmethylcarbinol) during the process of glucose fermentation. All the isolates under this study were negative for VP test which indicated the absence of acetymethylcarbinol production by these pathogens. Citrate utilization test determines the ability of a bacterium to utilize citrate as side carbon source. After 4 days of incubation all the isolates were found positive for citrate utilization. MR–test differentiates between the organisms producing high acidity and those producing an initially lower acidity which reverts towards neutrality. After 5 days incubation, methyl red reagent was added and all the isolates showed negative response. After incubation of the cultured isolates in bacto-tryptone medium, reagent for indole test was added and all the Xoo isolates showed negative results. Presence of milky white precipitate or opaque zones around Xoo colonies indicated the positive test. All the Xoo isolates had hydrolyzed the tween 80 that was manifested by the presence of opaque zone around the colonies after 3 days of incubation. The Xoo isolates inoculated by stab method were found unable to utilize arginine and considered as negative for ADH test. Artificially inoculated plants showed symptoms of disease in the glass house (Fig. 3). Production of BLB lesions on a susceptible rice line IR 24 confirmed the pathogenicity of the bacterial colonies isolated from infected plant samples. Data was recorded after 15 days of inoculation. Bacterial identity was further confirmed by performing Koch’s postulates. Furthermore, isolates were reconfirmed by performing pathogenicity tests. For determining aggressiveness, results showed different ratings of disease severity on Super Basmati and Basmati 2000 for all the 30 isolates. All isolates were found pathogenic, produced lesion, on IR24 (susceptible check) with variable severity. Maximum leaf area affected (LAA) was observed for PXo-20 followed by PXo-16, collected form Sheikhupura. Isolate of Sheikhupura were overall more pathogenic than rest of isolates (Table 3 in supplementary data). PXo-20 and PXo-16 were highly virulent on Basmati Super and Basmati-2000 in virulence analysis. They have produced LAA of 51.35% and 50.05% respectively. Only one isolate PXo-02 collected from Hafizabad was found less virulent while rest of them were virulent on Basmati super and Basmati 2000 (Table 3 in supplementary data). Among the cereals, rice and wheat share equal importance as leading food source for human worldwide. However, rice production is constrained by diseases of fungal, bacterial and viral origin. Bacterial blight of rice caused by Xoo is one of the most serious and oldest known disease of rice . Purpose of present study was isolation and characterization of the Xoo isolates through morphological, biochemical and virulence analysis. The samples were collected from nine different rice growing areas of Punjab and plated to isolate the casual organism causing bacterial blight disease. Then, these isolated cultures of Xoo were purified. Colonies on agar plate illustrated size, shape, color, margin, and elevation of certain pathogen. These growth patterns provide clues to the identification of the organisms. Among various colonies, which appeared on NA plates, only yellow, circular and viscous colonies were picked. These were the characteristics of Xoo as already described standard . Gram–staining technique was done and after microscopic study, it was concluded that all Xoo isolates were gram–negative bacteria and with scattered arrangement. The biochemical characterization of Xoo isolates were also executed in this study. In indole test bacto-tryptone is the substrate for the production of indole. Some bacteria have the ability to break-down the amino acids tryptophane with the formation of indole. But indole test was found negative for all isolates . Glucose–phosphate medium as recommended for the MR & VP tests for the differentiation of E. coli and Aerogenes group. Negative VP test indicated the absence of acetyl methyl–carbinol compound. MR–test distinguishes between organisms which produce and maintain high acidity and those producing an initially lower acidity which reverts towards neutrality. Negative results indicated that the culture was free from E. coli. Citrate utilization test determines the ability of an organism to grow in a synthetic medium containing citrate as side carbon source. Citrate utilization test was found positive for all Xoo isolates indicated the presence of citrate permease (enzyme) by the help of which Xoo can grow on citrate media . Pathogenicity tests confirmed that the isolate were Xoo and produced the characterized symptoms on IR-24. Although, behavior of pathogenicity was different which is may be due to morphological and pathological differences among isolates. Using Basmati Super and Basmati-2000 for virulence characterization was imperative because both are the main rice varieties cultivated on major area of Punjab. Moreover, Basmati super is main export of the country and to test the level of aggressiveness on these two varieties gave an idea how destructive these isolates can be to the major rice varieties. Xa-21 gene is already recommended to be most effective in Punjab against BLB  but presence of highly virulent isolates in Sheikhupura and virulent in rest of location in Punjab is alarming and there is dire need to incorporate new resistance genes in commercial rice cultivars to cope with the BLB on the patterns already opted for other crops in country [21-23]. Khan AS, Imran M, Ashfaq M. Estimation of genetic variability and correlation for grain yield components in rice (Oryza sativa L.). Journal of Agriculture and Environtal Sciences, (2009); 6585-590. Naveed SA, Babar M, Arif A, Zafar Y, Sabar M, et al. Detection of bacterial blight resistant gene xa5 using linked marker approaches. African Journal of Biotechnology, (2010); 9(24): 3549-3554. Swings J, Van den Mooter M, Vauterin L, Hoste B, Gillis M, et al. Reclassification of the Causal Agents of Bacterial Blight (Xanthomonas campestris pv. oryzae) and Bacterial Leaf Streak (Xanthomonas campestris pv. oryzicola) of Rice as Pathovars of Xanthomonas oryzae (ex Ishiyama 1922) sp. nov., nom. rev. International Journal of Systematic Bacteriology, (1990); 40(3): 309-311. Onasanya A, Ekperigin M, Nwilene F, Sere Y, Onasanya R. Two pathotypes of Xanthomonas oryzae pv. oryzae virulence identified in West Africa. Current Research in Bacteriology, (2009); 2(2): 22-35. Khan J, Jamil F, Gill M. Screening of rice varieties/lines against bakanae and bacterial leaf blight (BLB). Pakistan Journal of Phytopathology, (2000); 12(1): 6-11. Khan MA, Naeem M, Iqbal M. Breeding approaches for bacterial leaf blight resistance in rice (Oryza sativa L.), current status and future directions. European Journal of Plant Pathology, (2014); 139(1): 27-37. Wang Y, Pi L, Chen X, Chakrabarty P, Jiang J. The ubiquitin ligase XB3 interacts with the rice receptor-like kinase Xa21 and is required for Xa-21 mediated disease resistance. Plant Cell, (2006); 18: 3635-3646. Dinh HD, Oanh NK, Toan ND, Van Du P, Loan LC. Pathotype profile of Xanthomonas oryzae pv oryzae isolates from the rice ecosystem in Cuulong Rever Delta. Omonrice, (2008); 16(1): 34-40. Udayashankar A, Nayaka SC, Reddy M, Srinivas C. Plant growth-promoting rhizobacteria mediate induced systemic resistance in rice against bacterial leaf blight caused by Xanthomonas oryzae pv. oryzae. Biological Control, (2011); 59(2): 114-122. Jabeen R, Ashraf M, Ahmad I. Evaluating the effects of cold water diffusates against Xanthomonas oryzae pv. oryzae causing bacterial leaf blight (BLB) in rice. Archives of Phytopathology and Plant Protection, (2009); 42(2): 173-187. Noda T, Li C, Li J, Ochiai H, Ise K, et al. Pathogenic diversity of Xanthomonas oryzae pv. oryzae strains from Yunnan province, China. Japan Agricultural Research Quarterly, (2001); 35(2): 97-104. Akhtar MA, Abbasi FM, Ahmad F, Shahzad M, Shah MA, et al. Evaluation of rice germplasm againt Xanthomonas oryzae causing bacterial leaf blight. 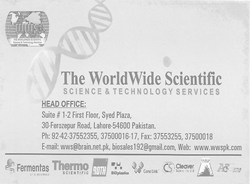 Pakistan Journal of Botany, (2011); 43(6): 3021-3023. Jabeen R. Medicinal plants-a potent antibacterial source against bacterial leaf blight (BLB) of rice. Pakistan Journal Botany (2011); 43111-118. Ali A, Khan MH, Bano R, Rashid H, Raja NI, et al. Screening of Pakistani rice (Oryzae sativa) cultivars against Xanthomonas oryza pv oryzae. Pakistan Journal of Botany, (2009); 41(5): 2595-2604. Akhtar M, Rafi A, Hamed A. Comparison of methods of inoculation of Xanthomonas oryzae pv. oryzae in rice cultivar. Pakistan Journal of Botany, (2008); 40(5): 2171-2175. Mew T. Current status and future prospects of research on bacterial blight of rice. Annual Review of Phytopathology, (1987); 25(1): 359-382. Gnanamanickam S, Priyadarisini VB, Narayanan N, Vasudevan P, Kavitha S. An overview of bacterial blight disease of rice and strategies for its management. Current Science, (1999); 77(11): 1435-1444. Agarwal P, Mortensen CN, Mathur S. Seed-borne diseases and seed health testing of rice. Phytopathological papers, (1989); (30). Ding X, Cao Y, Huang L, Zhao J, Xu C, et al. Activation of the indole-3-acetic acid–amido synthetase GH3-8 suppresses expansin expression and promotes salicylate-and jasmonate-independent basal immunity in rice. The Plant Cell Online, (2008); 20(1): 228-240. Khan JA, Arshad HMI, Saleem K, Sandhu AF, Hasnain S, et al. Evaluation of resistance genes in rice against local isolates of Xanthomonas oryzae pv. oryzae in Punjab Province of Pakistan. Archives of Phytopathology and Plant Protection, (2012); 45(15): 1826-1839. Khan MAU, Shahid AA, Rao AQ, Kiani S, Ashraf MA, et al. Role of epicuticular waxes in the susceptibility of cotton leaf curl virus (CLCuV). African Journal of Biotechnology, (2013); 10(77): 17868-17874. Muzaffar A, Kiani S, Khan MAU, Rao AQ, Ali A, et al. Chloroplast localization of Cry1Ac and Cry2A protein-an alternative way of insect control in cotton. Biological Research, (2015); 481-11. Awan M, Abass M, Muzaffar A, Ali A, Tabassum B, et al. Transformation of Insect and Herbicide Resistance Genes in Cotton (Gossypium hirsutum L.). Journal of Agricultural Science and Technology, (2015); 17(2): 287-298. Arshad HMI, Naureen S, Saleem K, Ali S, Jabeen T, Babar MM (2015). Morphological and biochemical characterization of Xanthomonas oryzae pv. oryzae isolates collected from Punjab during 2013. Adv. Life Sci. 2(3). pp: 125-130.